Outdoor furniture are designed specifically for outdoor use, and made from weather-resistant materials in order to prevent corrosion. Different types of outdoor furniture include chairs, seating sets, tables, dining sets, and loungers & daybeds. The main purpose of outdoor furniture is to offer appropriate décor, and comfort. Over the past few years, urbanization has gained an immense upsurge, along with rapid growth of the real estate industry. Growing number of hospitality industries, office spaces, public gardens, and open-air sports areas have entailed huge demand for outdoor furniture across the globe. In addition, increased integration of various attributes such as aesthetics and light-weight have further accelerated the adoption of outdoor furniture in residential as well as commercial spaces. Governments across the globe are making more investments in creating open spaces such as sports and public gardens, in order to offer people with areas to relax. Initiatives such as these are leading toward increasing demand for furniture required for such open spaces. One of the latest trends currently being witnessed in the market is seamless transition from home to outdoor spaces using rugs, ottomans & side tables, throw pillows, and layered blankets. The global market for outdoor furniture will register a steady expansion over the forecast period 2017 to 2022, according to Transparency Market Research’s (TMR) recently published report. Global sales of outdoor furniture are estimated to account for over US$ 1,600 Mn revenues by 2022-end. Asia-Pacific excluding Japan (APEJ) will continue to account for the largest revenue share of the global outdoor furniture market. However, the market in Europe will increase at a CAGR higher than the market in APEJ through 2022, with France, The U.K., and Germany anticipated to lead in terms of this region’s overall demand for outdoor furniture. Based on material, sales of metal and wood are expected to witness a parallel expansion through 2022. However, wooden outdoor furniture will remain more lucrative than the outdoor furniture made from metal, in terms of revenues. In addition, sales of textile-based outdoor furniture will witness a slightly faster expansion than those made from metal and wood through 2022. Chairs are expected to remain sought-after among products in the market, with sales poised to bring in nearly US$ 3,500 Mn revenues by 2022-end. Dining sets and seating sets are anticipated to be the fast-selling products in the market. Revenues from sales of dining sets and seating sets will account for over one-fourth revenue share of the market in 2017. Both these product type segments will witness a significant rise in demand over the forecast period. E-commerce is expected to emerge as the fastest expanding sales channel for outdoor furniture, followed by discount stores and rental stores. However, retail stores and direct to consumer segments based on sales channel are anticipated to lead the market in terms of revenues. Revenues from e-commerce sales channel will also account for a major share of the market over the forecast period. On the basis of end-users, residential segment is projected to hold roughly half revenue share of the market during 2017 to 2022. This can be mainly attributed to increase in housing sales across the globe. The largest revenue share of outdoor furniture sales to residential end-users will be accounted by APEJ. Sales of outdoor furniture to commercial end-users are expected to exhibit a moderate expansion through 2022. The global market for outdoor furniture is highly diversified and competitive. In a bid to position themselves as energy-efficient and environment-friendly stores, vendors in the market are increasingly concentrating on furnishing items in retail space, and launching handcrafted furniture. Key players identified by TMR’s report on the global outdoor furniture market include Agio International Co., Inc., Ashley Furniture Industries, Inc., Brown Jordan International, Inc., Century Furniture LLC, Inter Ikea Systems B.V., Kimball International, Inc., La-Z-Boy Incorporated, Steelcase Inc., Herman Miller Inc., and HNI Corporation. Transparency Market Research (TMR) has recently delivered a research report on the global outdoor furniture market. This report studies the market for outdoor furniture at a global scale, covering the market dynamics extensively, and gives information about key trends impacting the market. The report on the global outdoor furniture market delivers an in-depth knowledge base for major players in the market, who seek global expansion. 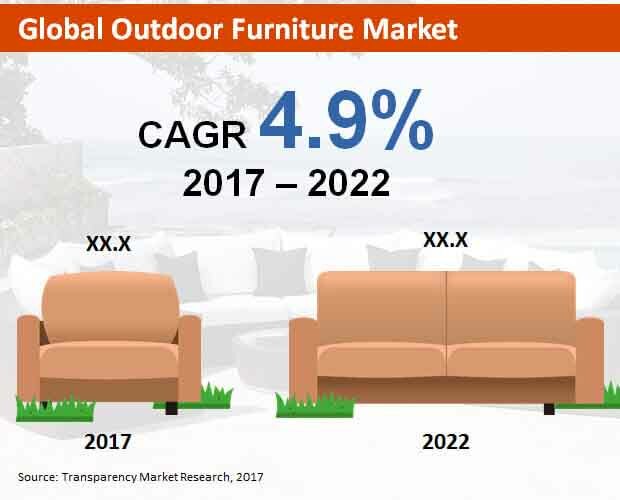 Analysis provided in the report is indispensable for players and investors in gauging their future expansion potential in the global outdoor furniture market. The report begins with an executive summary of global outdoor furniture market, which sheds light on key research findings associated with the product and regional segments, coupled with the most significant and relevant market numbers. The forecast CAGR (2017-2026) as well as the historical CAGR (2012-2016) have been provided in this chapter. The executive summary also comprises information related to regions that are lucrative for the global outdoor furniture market’s expansion, based on market revenue shares and sales growth rate over the forecast period. A chapter on overview follows the global outdoor furniture market’s executive summary, and delivers a quick introduction of the market along with a formal definition of “outdoor furniture”, in turn implying report readers the scope of this market. Subsequent chapters in the report offer information on market dynamics including drivers, restraints, opportunities & trends impacting the market expansion. Analysis on raw material sourcing strategy, supply chain, and cost structure is also covered in the report. The report delivers a segmentation-wise analysis on global outdoor furniture market. Segmentation of the market has been done based on product type, sales channel, end-user, material, and region. The chapter offering segmentation analysis includes imperative market numbers pertaining to revenue comparison, year-on-year growth comparison, and market share comparison. Geographically, the report categorizes the global outdoor furniture market into Asia-Pacific excluding Japan (APEJ), Latin America, North America, Middle East & Africa (MEA), Europe, and Japan. The region-wise analysis is for assisting report readers in gleaning information about the market performance in the aforementioned regions. It also offers readers with general overview of the business environment across these region in terms of key economic, social, and political factors. The report delivers an intensity map, which tracks presence of active participants in the global outdoor furniture market. The report’s concluding chapter offers insights on these market players, coupled with information about the market’s competitive landscape. Analysing key market players exhaustively, the report has delivered information on key financials, SWOT analysis (strengths, weaknesses, opportunities, & threats), product overview, key developments, and company overview related to that particular company. The competitive landscape is an extremely valuable chapter for report readers, as it comprises all necessary data for analysing contribution of key players to growth of the market. In addition, this chapter enables studying way of the market players’ strategy implementation, along with their aims of staying at the top of this highly competitive market. The report on the global outdoor furniture market follows an extensive research methodology that relies on both secondary and primary research for gleaning every necessary information associated with the market. The qualitative aspects gathered from key opinion leaders and various industry experts have been utilized during evaluation of the report. All the information collected is validated thoroughly by TMR’s analysts to deliver the most accurate market insights. Clients may use this information as an authoritative source while making their business decisions.